New York's biggest display of contemporary art is just as astonishing as ever. For the uninitiated, The Armory Show is an annual art show hosted in New York City housing galleries from around the world who display/sell modern art in its many forms. The show is kind of like an oversized MoMA and this year had over 200 exhibitors. At The Armory Show one can find anything from contemporary painting, sculpture, to installation, and at least one performance piece. The show has been going strong since its opening in 1913 and this year was no different. I'm here to bring you some of my highlights from this year's incarnation. Unfortunately, the highlights I have from the show distinctly reflect my personal artistic preferences; however, I still feel I have a nice range of pieces to show off. Zero is a South African artist based in Cape Town. 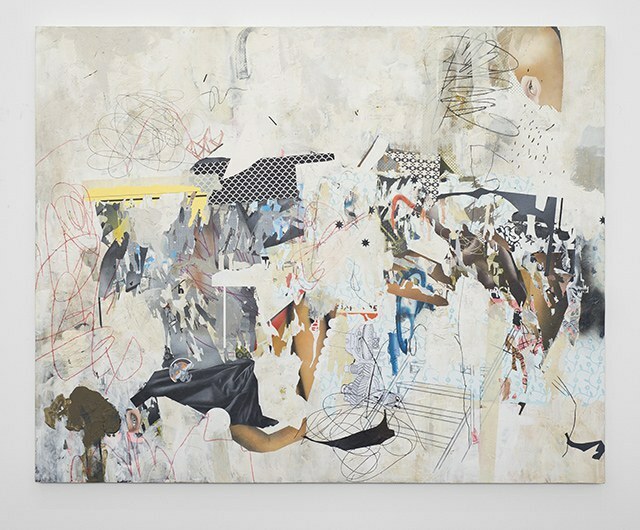 Her paintings and collages are reminiscent of the work of Basquiat and other such abstractions. Her work is an excellent example of modern abstract expressionism and the direction abstract painting is heading in. Furthermore, the use of collage has had a resurgence in the past years, as can be seen in works like these. 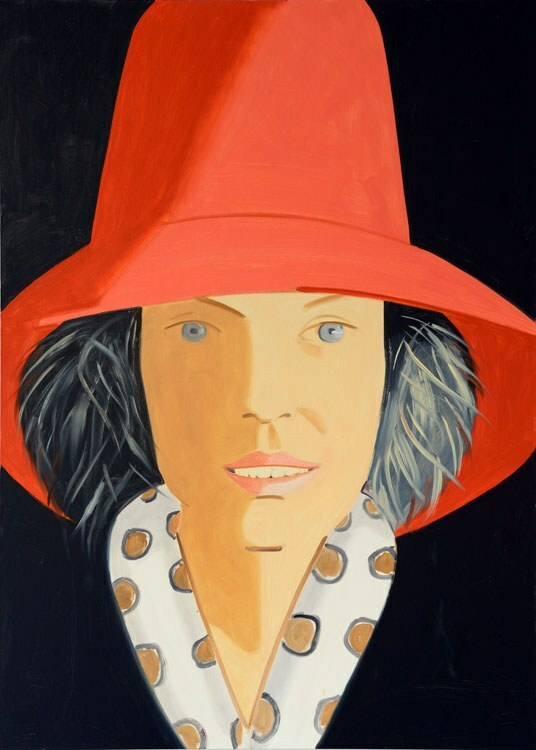 Alex Katz is arguably one of the most famous portrait artists of the 20th century. His distinctive style makes his work impossible to miss. In fact, I must have spotted at least six Katz paintings while at the show. Warhol once claimed he stole his famous solid color backgrounds from Katz. This specific piece is a perfect example of his simplified painting style, use of bright color, and the piercing close-up portraits he loved. Marina Abramović is a performance artist originally from Yugoslavia (now based in upstate New York). Her work has been featured prominently in the MoMA and other famous museums of modern art. Photographs from her performances, like this one, are highly sought after. Her work is entirely based on heightened emotion and human connection. She is one of my personal favorites and I highly recommend checking out her work. 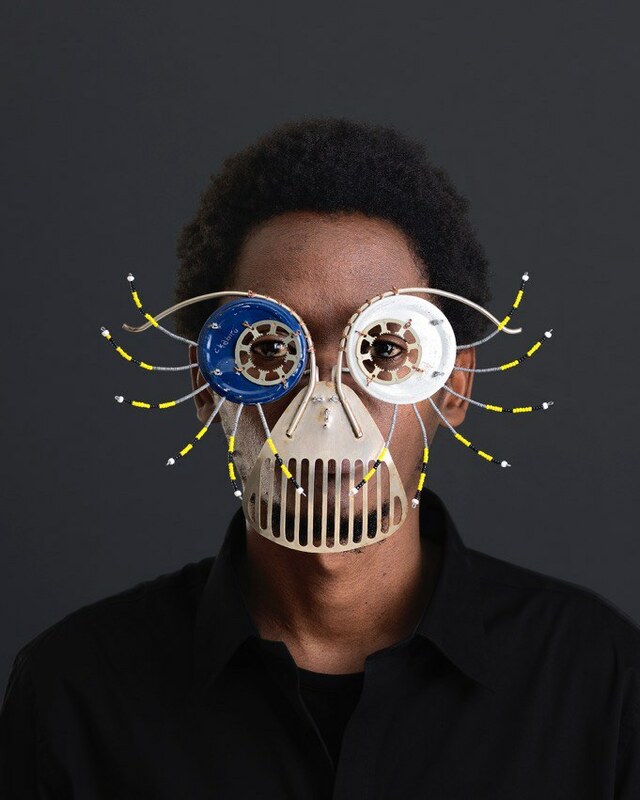 To create his images, Cyrus Kabiru digs through the trash of Nairobi to find metal pieces and assorted electronic parts. He fashions these into glasses for his subjects to wear. He says when he was young his father never wanted him to have a pair of glasses, and so his obsession began. Note that the title of this piece includes the word "Trump". Take from that what you will. 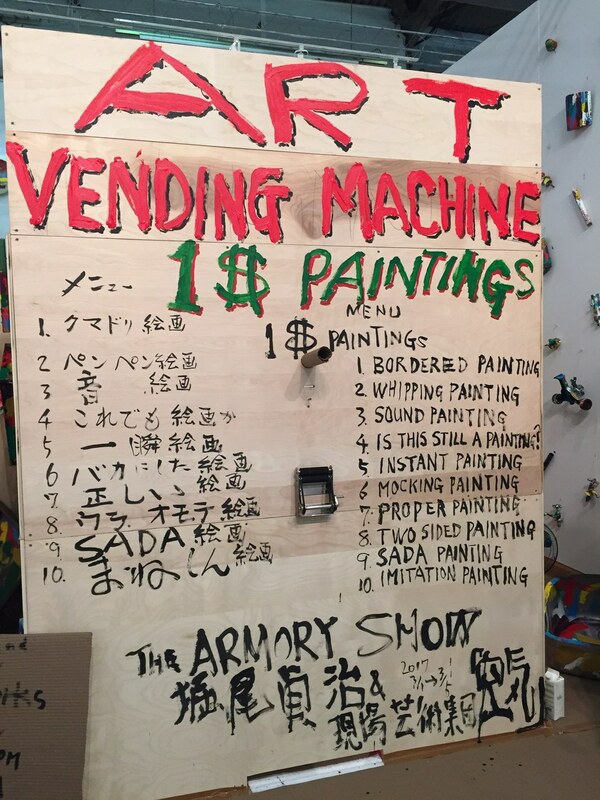 Japanese artist Sadaharu Horio sat in this makeshift "Art Vending Machine" at set hours during the week of The Armory Show. The patron would insert a dollar, choose a painting category, and in a minute Horio would slide a painting out of the bottom of his box. This piece is easily a clever statement on the relationship between artist and observer, as well as a comment on our love of instant gratification. Indeed, the piece had a huge crowd around it when I saw it. Hadieh Shafie makes feel good art pieces in every sense of the word. 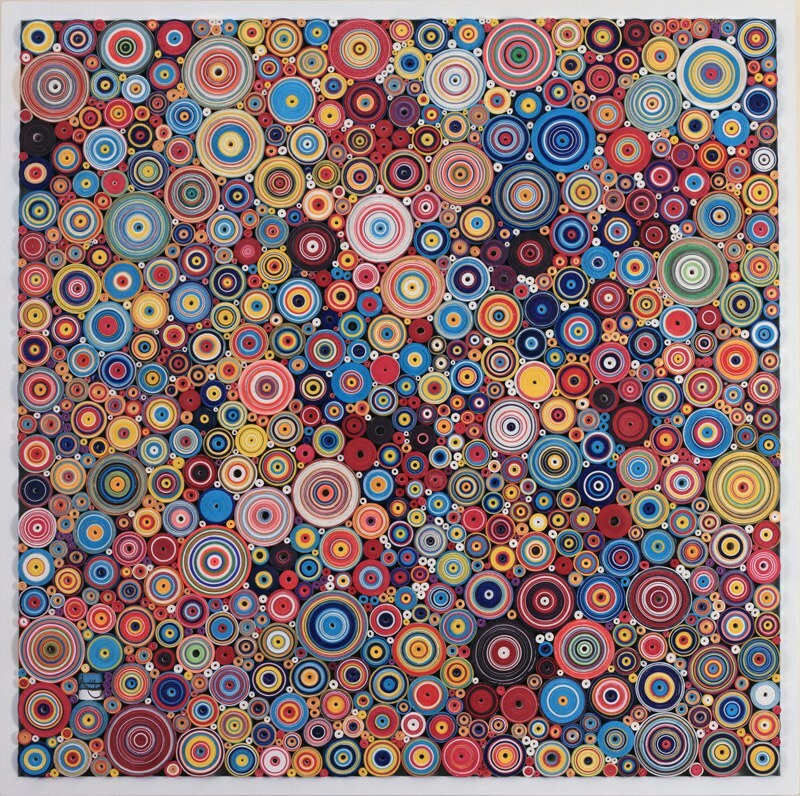 Firstly, her pieces are a delight to look at, possibly resembling a color blindness test with better colors. However, if one reads the description of her pieces, they will find that they are made of rolled up paper that each say a different uplifting Farsi word (this one specifically being love). In times like these, who couldn't use some more colorful love? 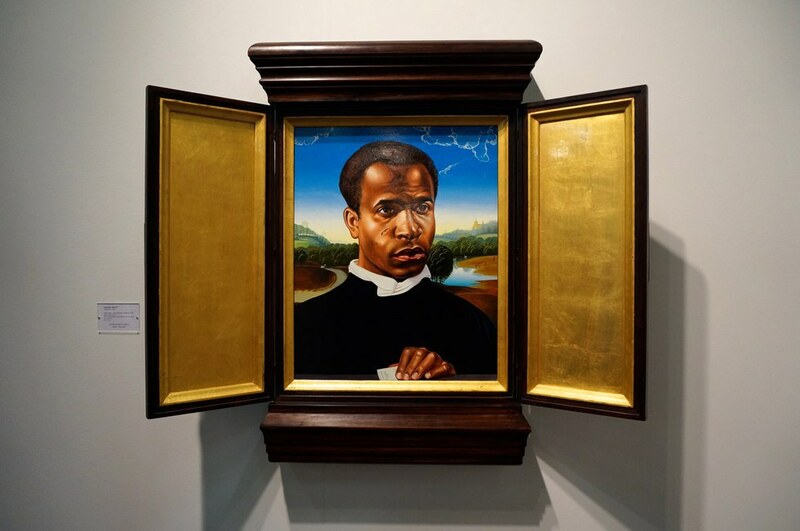 In the past few years, Kehinde Wiley has become highly recognized for her paintings of young black men and women in the style of renaissance masterpieces. This specific piece is a portrait of revolutionary anti-colonialist Frantz Fanon, in the style of a moderately famous Hans Memling painting from 1475. Wiley's work is highly political and extremely relevant in today's America. Again, she is an artist to check out and definitely keep an eye on. At first glance, one might mistake Deborah Kass' paintings for Warhol's. 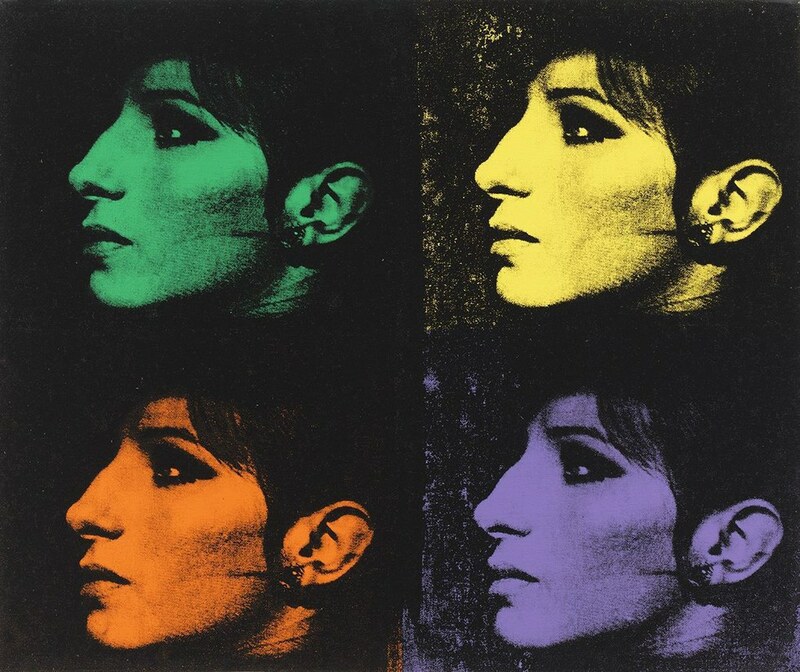 However, Warhol never painted Barbra Streisand (or any Jewish icon for that matter). Kass recreates Warhol's iconic style but inserts her own icons. In this series she replaces Jackie Kennedy with an assortment of famous Jewish women. Being a big Streisand fan, I was lucky enough to stumble upon this piece in the back room of one of the gallery's many exhibit spaces. Hannah Wilke's poster speaks for itself. 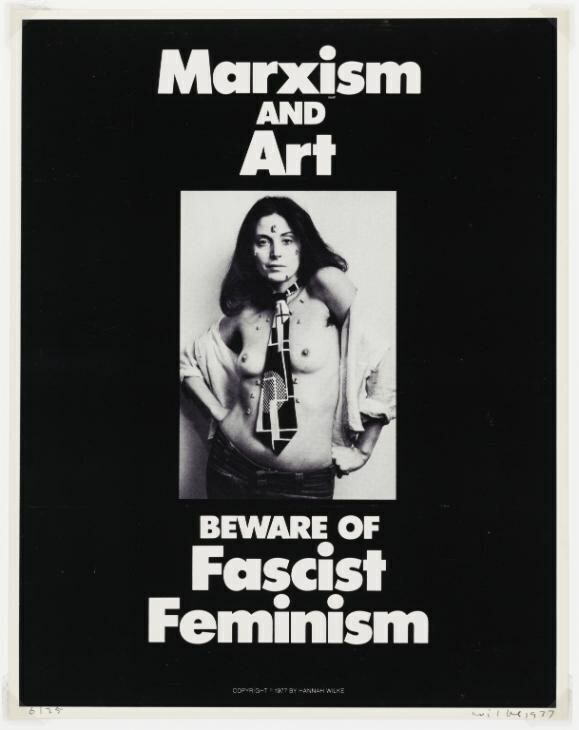 She made the piece in 1975, and like it or not, it is still relevant today. Take a moment to contemplate what she means by "Fascist Feminism". I guarantee you it does not mean the Feminazis that meninists like to talk about. Think along the lines of any exclusionary form of feminism. 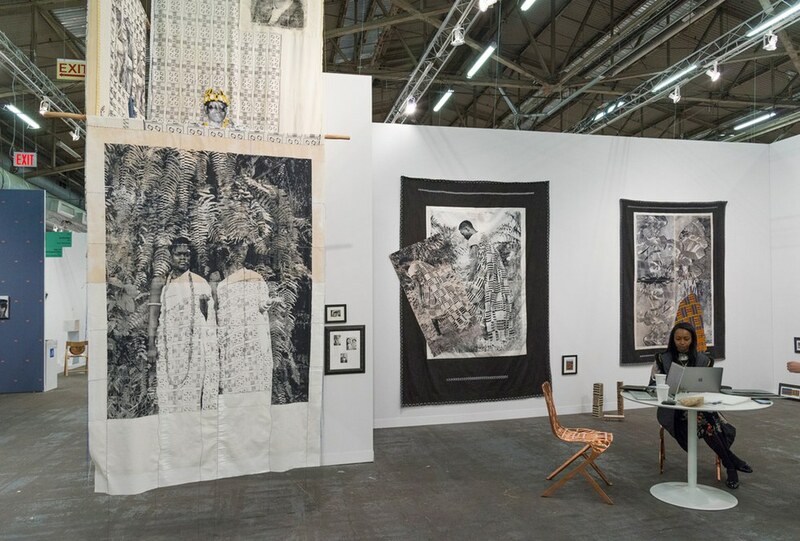 The gallery displaying Zohra Opoku's pieces won the first-ever Armory Show Booth Prize. It's easy to see why. Opoku's work is an arresting and absolutely beautiful visual statement on the lives of females in Ghana. The pieces hang huge and feel like tapestries. Her subjects begin to feel like deities. To raise poor Ghanian women into deities is quite the feat. This is why I saved this piece for last. Opoku's art is successful in its many purposes. I only wish everyone could see it in person. I'm telling you, her art was so beautiful that it had me wanting to ask how much for the piece even if I knew it would be thousands of dollars.